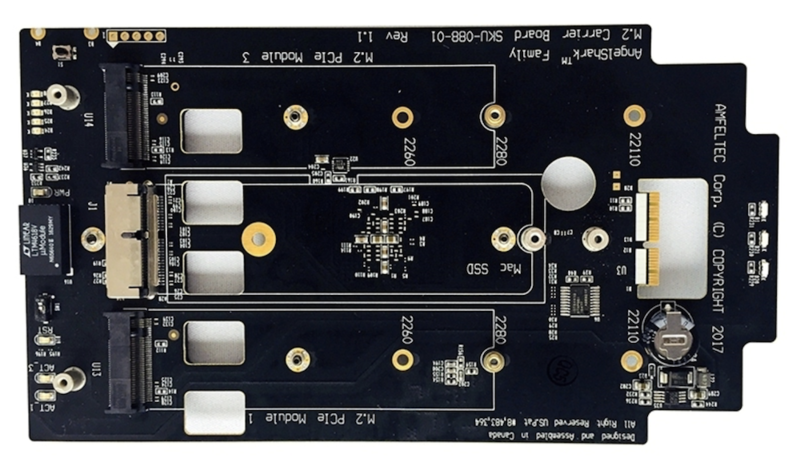 Amfeltec has created special carrier board that expands the internal PCIe-based flash storage capacity of your 'late 2013' Mac Pro. They call it AngelShark. 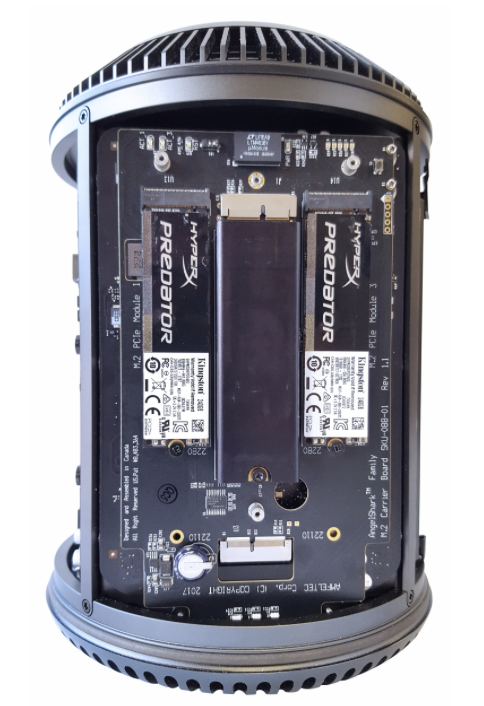 The AngelShark is a creative way to expand internal storage of your 'late 2013' Mac Pro by adding two M.2 PCIe-based flash storage blades to the left and right of the Apple proprietary PCIe-based flash blade. Consider the potential: You could have 2TB blades in each of the three slots for a total of 6TB internal capacity. The graphs are designed to demonstrate the various PCIe-based flash blade options available for your Mac Pro cylinder. If your Mac Pro was manufactured in late 2013 or early 2014, it likely has the "XP941" style blade that tops out at 1100MB/s. More recent Apple PCIe-based AHCI flash blades are capable of 2000MB/s. The latest NVMe PCIe-based blades are capable of 3000MB/s. However, newer Apple proprietary and generic M.2 blades "hit the wall" at 1500MB/s when installed inside the 2013 Mac Pro. Why? Because its Gen 2.0 PCIe 'pipeline' is rated at x4 Link Width and 5.0 GT/s Link Speed. But at least with newest compatible flash blades, you can be assured of a 50% boost over the original 2013 Apple factory "XP941" blade. The AngelShark's main 'mission' is to increase internal capacity and to add M.2 flexibility. You can stripe or mirror the multiple blades but keep in mind that the transfer speed will never be greater than 1500MB/s. Again, that's because they are sharing the same PCIe pipeline. The only other product that expands the internal storage of the 2013 Mac Pro is the Aura SSD by Other World Computing which has been around since 2015. It is still available. The only caveat is that the transfer speeds tops out at 724MB/s. As we wait impatiently for the 2018 modular Mac Pro, the "rest of us" who continue to flog the 'late 2013' Mac Pro 'turbo tube' can extend its useful life with upgrades like the AngelShark. Contact Amfeltec for a quote on the price of the AngelShark (SKU-088-01). Trans International sells the Apple connector compatible Super Blade. Other World Computing sells the Apple connector compatible Aura Pro X. They also sell the Aura SSD for Mac Pro. B&H Photo Video sells the M.2 Samsung 960 Pro NVMe. NewEgg sells M.2 Samsung 960 Pro and 960 Evo NVMe. Help support Bare Feats by clicking our Apple display ads or THIS Apple USA link when ordering any Apple product or Apple compatible product. Check out Apple Certified Refurbished products with same warranty as new.